AP Exams - check. SAT test - check. College Application - check. Date the wrong guy and ruin everything you've spent your whole life working for - check. Ultra-high-achiever Viviana Rabinovich-Lowe has always had a plan - and no room to be anything less than perfect. But her quest for perfection comes to a screeching halt when her boyfriend leaks racy pictures of her to the entire school. Making matters worse, her parents are getting divorced and now her perfect family is falling apart. For the first time, Viv feels like a complete and utter failure. Then she gets a job working at the community pool, where she meets a new group of friends who know nothing about her past. That includes Evan, a gorgeous guy who makes her want to do something she never thought she'd do again: trust. For the first time in her life, Viv realises she can finally be whoever she wants. But who is that? While she tries to figure it out, she learns something they never covered in her AP courses: that it's okay to be less than perfect, because it's our imperfections that make us who we are.
" "Will speak to many readers...A sensitive novel about accepting imperfection." -- "Kirkus Reviews"
"Once again, Kottaras has written beautifully about bravery, strength, and resilience in the face of devastating loss. An uplifting commentary on the beauty and necessity of accepting life's gifts even as it stands on your chest, refusing to let you breathe. Viviana fights through setbacks and heartbreak, showing us all what it means to be resilient. A tough but extraordinary read!" Charlotte Huang, author of "For the Record"
""The Best Possible Answer "is a beautiful exploration of the power that lies in the secrets we keep from ourselves and others, as well as the transformative nature of the truth." Jessica Love, author of "In Real Life"
"Authentic, gripping, and emotional, "The Best Possible Answer" is a study in mistakes how they define us, and how they don t. Readers will identify with Viviana as she grapples with family, friendship, and love, and learns the ultimate lesson that her future doesn t have to be determined by her past. The false veneer of perfection collides with trust and identity in a book that is both honest and brave." - Laurie Elizabeth Flynn, author of "Firsts"
Just enough sass, just enough heart, and a narrator to root for. "How to be Brave" ushered me into another yet familiar world. Come along for the ride. You'll be glad you did. "Ron Koertge, award winning author of Coaltown Jesus"
Powerful and rare, "How to Be Brave" is a wonderfully told story with gleams of humor and wit that will inspire readers to live their lives for real. "Robyn Schneider, bestselling author of The Beginning of Everything"
Georgia's realistically profane voice aptly captures her personality, carrying the novel; her traverse through grief and experimentation make for a believable and satisfying character arc. A thoughtful exploration of grief and life. "Kirkus Reviews"
How To Be Brave does a cartwheel in your heart. It artfully reminds us that bravery forges a path through fear and grief. "Courtney C. Stevens, author of Faking Normal"
Kottaras's debut traces Georgia's struggles and triumphs as she reluctantly sets out to fulfill her mother's final wish for her to try new things and be fearless. Georgia's Greek-American heritage offers a distinctive backdrop for the novel's themes of emotional healing and self-discovery, while Georgia herself emerges as a realistically flawed and genuine protagonist. "Publishers Weekly"
"""A perfect book for anyone trying to figure out what they want their life to look like, and how to be brave enough to make that life a reality." --"Booklist"" "Once again, Kottaras has written beautifully about bravery, strength, and resilience in the face of devastating loss. An uplifting commentary on the beauty and necessity of accepting life's gifts even as it stands on your chest, refusing to let you breathe. Viviana fights through setbacks and heartbreak, showing us all what it means to be resilient. A tough but extraordinary read!" Charlotte Huang, author of "For the Record"
"""A perfect book for anyone trying to figure out what they want their life to look like, and how to be brave enough to make that life a reality." --"Booklist"" ""The Best Possible Answer "is a beautiful exploration of the power that lies in the secrets we keep from ourselves and others, as well as the transformative nature of the truth." Jessica Love, author of "In Real Life"
"""A perfect book for anyone trying to figure out what they want their life to look like, and how to be brave enough to make that life a reality." 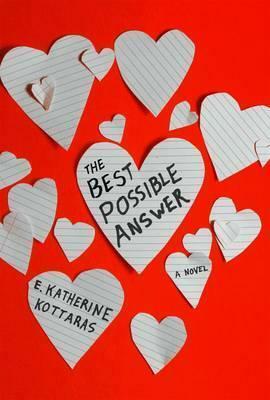 --"Booklist""
E. Katherine Kottaras is the author of the young adult novel How to Be Brave. She is at her happiest when she is either 1) at the playground with her husband and daughter and their wonderful community of friends, 2) breathing deeply in a full handstand, or 3) writing. She now lives in Los Angeles where she's hard at work on her next book.